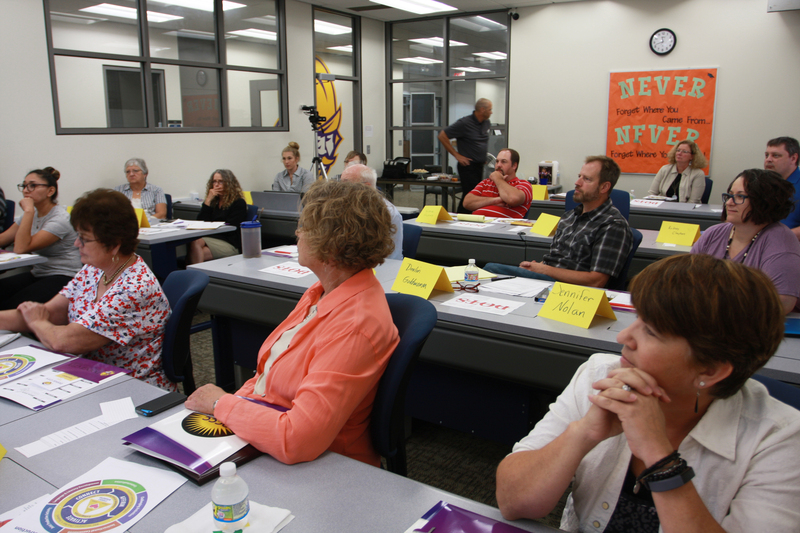 Effectively communicating instruction to a widely diverse student population carries special challenges for instructors at Dodge City Community College. Consider the ubiquitous freshman literature class: How does a professor assign relevant, thought-provoking reading material to a class consisting of a hodge-podge of cultural, ethnic, economic, and gender influences? How does an educator stitch that patchwork quilt into an instructional tapestry made up of Kansas farm-town kids and athletes from all over the country, pipe fitters and art majors, science geeks and bull riders, young single moms and middle-aged males? In an ever-growing portion of classes, students for whom English is a second language add to the complexity woven into the tapestry. 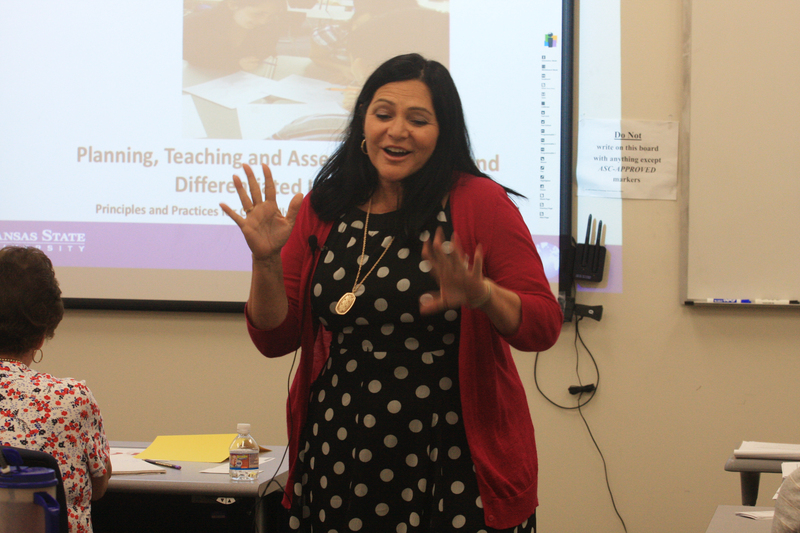 Dr. Socorro Herrera is an expert at bridging those challenging communications gaps, and she was on the DC3 campus Thursday to lead a faculty workshop about differentiated instruction. Dr. Herrera is one of the country’s leading experts on differentiated learning; having authored six textbooks and written numerous articles for leading academic journals. She is a widely-known international keynote speaker, consultant and trainer on the subject of cultural and linguistically diverse learning. Dr. Herrera is a professor in the department of Curriculum and Instruction, College of Education at Kansas State University, and serves as the executive director of the Center for Intercultural and Multilingual Advocacy. She recently received the World Science and Research Award from the World Council of Academics and University Researchers for her book “Biography-Driven Culturally Responsive Teaching” at the organization’s conference in La Habana, Cuba. Much of the discussion Thursday focused on understanding a student’s potential learning needs from perspectives beyond standard demographics. Simply because two students each check the “Hispanic” box on paperwork does not mean their life experiences or backgrounds are remotely similar. Socorro stresses that it is important to discover the biography of a learner rather than focus on the biology. When students understand that an instructor is actively trying to appreciate and acknowledge their individual backgrounds they have a greater tendency to persist in college careers, according to Herrera. Since the need for varied resources often exists within a single class, instructors are tasked with effectively communicating subject material while maintaining an appropriate level of instruction. 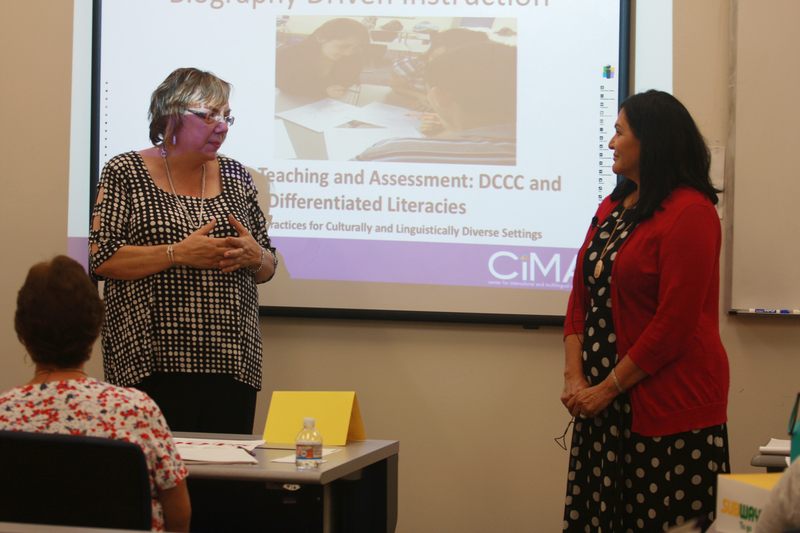 The workshops are part of ongoing faculty development at DC3, and Thursday was sponsored in conjunction with the college’s Title V grant initiative to develop pilot programs that help shape curriculum advances in several classrooms. People tend to live and learn in amorphous bubbles built on cultural, social and economic influences with little exposure to outside perceptions or influences. Thursday’s workshop benefits students by helping instructors develop classrooms and teaching methods that are inclusive and aware of the diversity of isolated backgrounds that make up the DC3 student population. The workshop benefits instructors by helping them identify their own bubbles and share their knowledge effectively while still being sensitive of different backgrounds. Some classes that the pilot projects will be attempted are composition, history, general psychology and ESL. Herrera spoke to a dozen or so faculty members Thursday, discussing thoughts about possible projects and initiatives instructors could use as part of the pilot programs. She will return on Aug. 13 and meet individually with those instructors to discuss the evolution of their projects. Herrera will also present her biography-driven information to the entire faculty on Aug. 13, just prior to the first classes of the fall semester. Thursday’s workshop was held at the DC3 Student Achievement Resource Center. The SARC director, Jorge Estrella, has a long connection with Herrera and her ability to bridge communications gaps. In 1999, Estrella was accepted into a scholarship program for students seeking a degree in education, but was denied admittance to K-State because of low English skills. Herrera was able to advocate for Estrella and help design a plan for him and his instructors to adapt, and Estrella was admitted and able to complete his education. Often, differentiated instruction can be as simple as presenting a topic with a variety of verbiage and vernacular. A very basic example would be instructors saying words like … construct, put together, erect, design a house to accurately convey the idea of build a house. “This approach gives students several opportunities to understand a particular topic,” Holwerda said. The increased opportunities to receive the same subject matter communicated in different ways can result in higher engagement and therefore more inclusive instruction.